Here's my final Best Of 2014 post. I've shown you my 2014 top makeup and nail picks and skincare and haircare favourites already and, last but not least, it's now time to give the body-care bits some attention. When I'm in a rush in the morning, the last thing that I want to do is slather my body in a sticky lotion and stand like a zombie for ten minutes, waiting for it to fully sink in. So, I leave all the full-body moisturising malarkey for the evenings and turn to a nourishing body wash instead, giving me hydration without the faff of using an extra product afterwards. No shower product kills two birds with one stone as well as Soap & Glory Whipped Clean. Whilst the luxurious ingredients, including Sweet Almond Oil, Macadamia Nut Oil, Shea Butter and Cocoa Butter keep skin soft, you don't feel as though you're left with a grimy coating when you're finished in the shower. The thick, rich formula lathers up, despite having such a creamy consistency, so I still feel fully clean and refreshed. Used alone, this stuff is lovely, but whenever I pair it with my Soap & Glory Scrub Gloves, my skin feels like an absolute dream. I favour sweetly scented body products, so this shower cream is right up my street, but it doesn't provide an energizing boost when you're feeling drowsy. With a mix of Almond, Pistachio and Sweet Vanilla scents, you're left smelling good enough to eat for the rest of the day. One tube lasts me for a few weeks and we all know how much of a bargain Soap and Glory products are! You can see a theme here, I'm sure; yes, I'm addicted to Soap & Glory. They're by far my favourite body care brand and even surpass more expensive options. For a fraction of the price, the quality is hot on the heels of the likes of L'Occitane and Bliss. Pulp Friction is my number one body scrub from the brand, as it isn't oil-based and doesn't leave the skin with any greasy residues when rinsed. This scrub gets the balance just right in terms of consistency; it spreads easily, but is thick enough to cling onto the skin, so you can really give it a good going over. Unlike many scrubs, this one foams up when applied onto wet skin, which feels a lot more cleansing. It isn't a particularly nourishing scrub, but it doesn't give you a tight or uncomfortable feeling after use. Perfect for prepping the skin before using self-tan, this product buffs away dead skin cells and flakey patches effectively and doesn't affect how the tan reacts to or sits on the skin. Had a tanning mishap? This will fix it fast. Whilst the exfoliating particles aren't too big, harsh or scratchy, it doesn't take much effort to be effective and I often use it during my morning shower for a quick exfoliate. Like all of the Soap & Glory products, this of course smells delicious. The zingy, fruity fragrance is invigorating and actually makes my mouth water, thanks to fig, peppermint, lemon and orange. Yum. Body moisturisers aren't exactly hard to come across, but I struggle to find ones that actually treat dry skin effectively and quickly, whilst smelling amazing. With most formulas, especially those from high-street brands, you have to choose which attribute to sacrifice. With the plethora of flavours on offer, catering for a wide variety of skin types, The Body Shop has a body butter for everyone and they are darn good! All year round, before bed, I like to slather a generous helping everywhere, or, if I'm in a hurry to catch some z's or I apply some in the morning, then I'll do the important bits (elbows, knees and shins) and skip the rest. 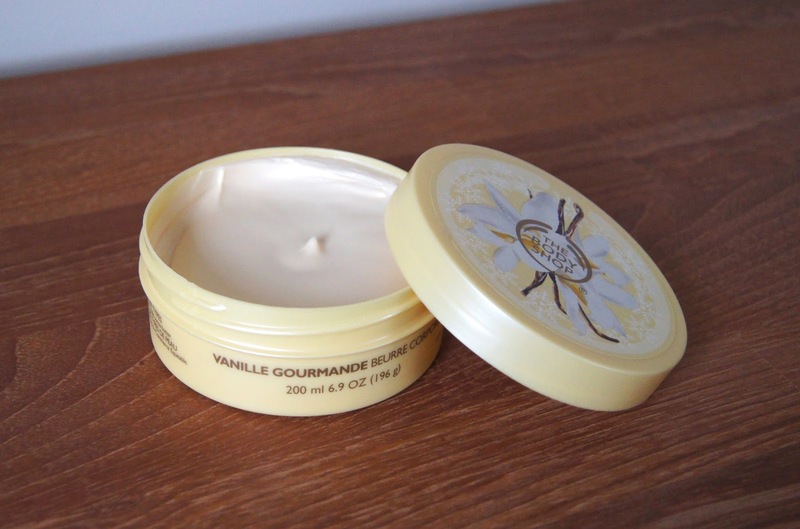 In my opinion, the best of The Body Shop bunch is the decadent, sickly-sweet Vanilla Bliss. Of course, body butters are just as their name suggests, rich and quite greasy, but even though the vanilla version is suited to all skin types, I'd say that this formula could be too heavy-duty for some people. In my experience, this one hasn't been too much, but if you have sensitive skin or you're prone to breakouts on your body, then you may want to look at a lighter lotion instead. Made with Cocoa Butter, the formula doesn't completely absorb into the skin and does leave a slippery surplus behind, hence why I prefer using them at night. Come morning-time, my body has lapped up all of that excess moisture and is fully hydrated. By far, these body butters are the best at turning rough, flakey, parched skin into something smooth, supple and so soft. Skin glows with health and they give the body a model-esque, glossy look whenever used. The gorgeous scents linger all day after application and are quite strong, so it isn't necessary to wear a separate perfume, if you don't want to. If you haven't tried The Body Shop body butters yet, then I highly recommend you go and give them a cheeky sniff and try one. Over the years, especially whilst I was at University hitting nights out harder than my hermit-like self does now, I tested out my fair share of self-tan. From St Tropez to St Moritz, all fake tan has its problems. Firstly, being tangoed is an absolute nightmare. Secondly, more often than not, it dries up the skin. And of course, there's that dreaded biscuit smell! 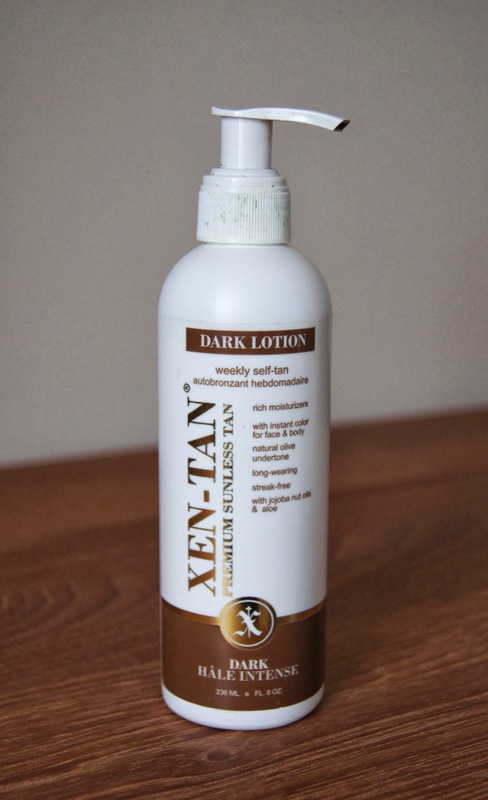 No fake tan that I've tried is perfect, but the Xen Tan Dark Lotion is the closest that I've found so far. Being a lotion, as opposed to a mousse or spray, the gel-like formula is hydrating and spreads easily over the body, minimising streaks. Rather than give you a totally obvious, radioactive glow, this product has green undertones to it, which may sound scary, but create a more natural, olive-toned result. Think a beach babe, 'I've spent a few weeks in the Bahamas', kind of colour. Another plus, this formula doesn't dry my skin out or go horrendously patchy after a meagre two days of wear, compared with others. Always bear in mind that making sure you're thoroughly exfoliated before use and keep topped up with moisturiser will always extend the longevity of your tan. Initially, you smell like a massive chunk of Battenburg cake wrapped in sickly Marzipan, but there's no getting away from that tell-tale, biscuit smell once the tan has developed, I'm afraid. On me, this faux-tan lasts a decent, five days looking great, before it wears down and starts to resemble a dodgey rash around my feet, wrists, knees and elbows. As soon as that starts to happen, I either scrub it all off and stay a few shades lighter for a while, or start over from scratch. I find that this self-tan is effortless to apply with either a mitt or your hands (I'd advise wearing gloves to prevent your palms from turning mahogany) and you achieve a flawless tan that will get you a tonne of compliments - that can't be bad! I didn't have to take any time to think about this category; my choice was instant. 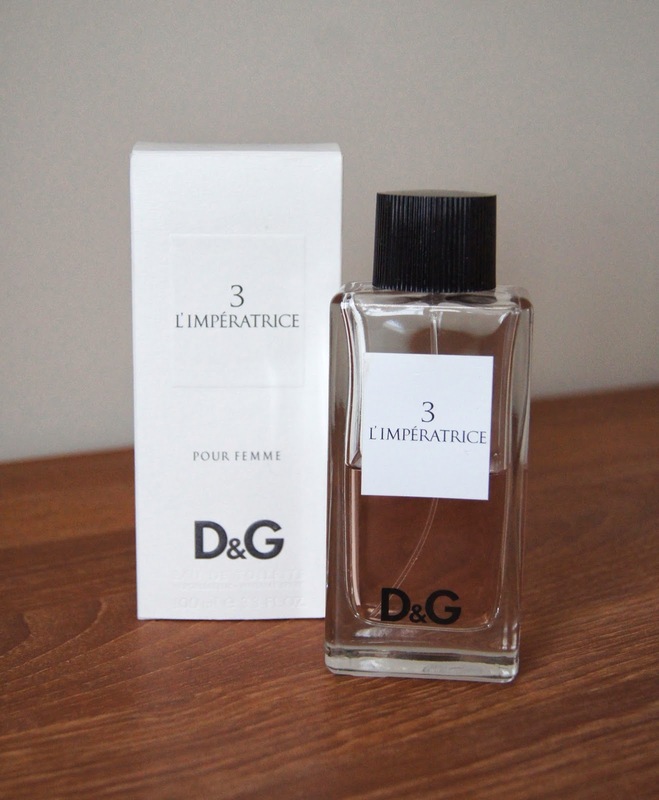 Without a doubt my favourite fragrance of 2013 was the D&G 3 Pour Femme L'imperatrice. Three, brand new bottles of this scent graced my dressing table last year, which shows how much I reached for it and it brings back so many wonderful memories. Fruity and fresh, this delicate perfume has top notes of Rhubarb, Kiwi, Watermelon and Red Currents, whilst the base is more sensual, thanks to Sandalwood, Musk and Grapefruit. It's definitely a perfect, Spring/Summer scent as it's vibrant and bright, giving you a surge of energy as soon as you spray it. Once I've doused myself sufficiently, the fragrance lingers all day, but isn't too overpowering. Whenever I spritz a little onto any fabric, it lasts until the items are washed. Simple, clean and classic, the bottle isn't anything too special, but it's all about what's inside, after all. After becoming my signature scent, I will always have a place in my perfume collection for L'imperatrice. There's not much else to say about this fragrance, really. All there is to do now is go and scout out a bottle, to see whether you agree with me. It's said that hands give away a person's true age. The face may look fabulous and line-free, but chances are those hands will be crepey and worn. Already, my hands are giving the game away and look as though they're attached to someone that's about 50, not 23. I have a 'thing' about my hands feeling greasy or dirty so I'm forever over-washing them, which makes them dry and chapped, especially during bitter weather. In a bid to halt the aging process and try to rewind that clock, I decided to make a concerted effort to use hand cream as often as possible last year. In my experience, hand creams are either a total hit or miss. They actually need to make a lasting difference and preferably quickly, they need to smell nice and they need to have a rich, but non-greasy texture. 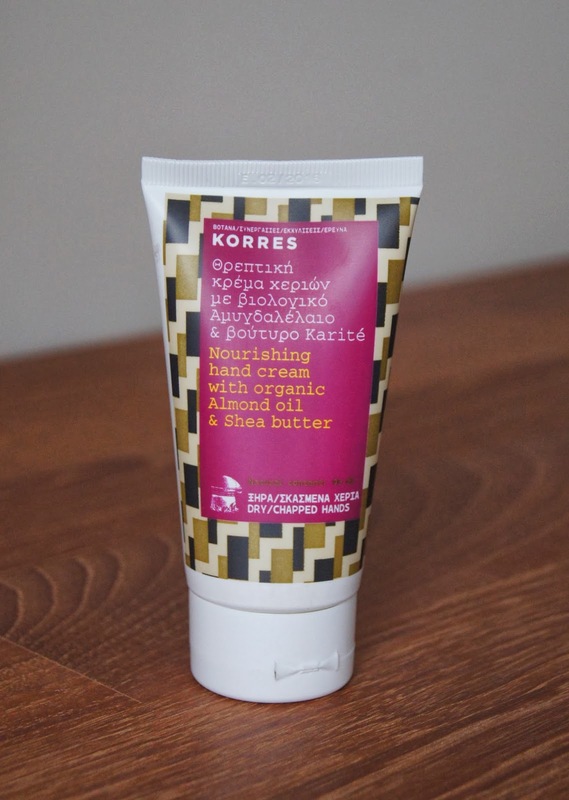 The Korres Nourishing Hand Cream with Almond Oil and Shea Butter, which contains 96.6% natural ingredients, is just right. It's not so thick that you have to massage it in for five minutes, but it's enough to nourish and soothe straight away. Being very light in texture, it feels almost watery when rubbed in. On first use, I wasn't expecting it to do all that much, but next morning, my hands were no longer sore and rough. After a few days, my hands were transformed and restored back to looking and feeling healthy. I have naughtily waned on the hand cream application as of late and my hands are definitely not happy about it, but I know I can always count on this cream to save the day. My search for the best eyelash curlers has come to a halt. Squeeze, pump and angle. It's a simple method to obtain that long lash look, but if you're armed with an average pair of lash curlers, your efforts will be futile. Clamp the Kevyn Aucoin babies on, though and even minimal work gives incredible results. After the first use, I couldn't stop glancing at my seemingly mile-long, perfectly fanned out lashes every two minutes. That isn't me unashamedly blowing my own trumpet, by the way. No, 100% of the credit goes solely to KA and the miracle tool that he has created. Sorry, Shu Uemura, but I think you're second best. 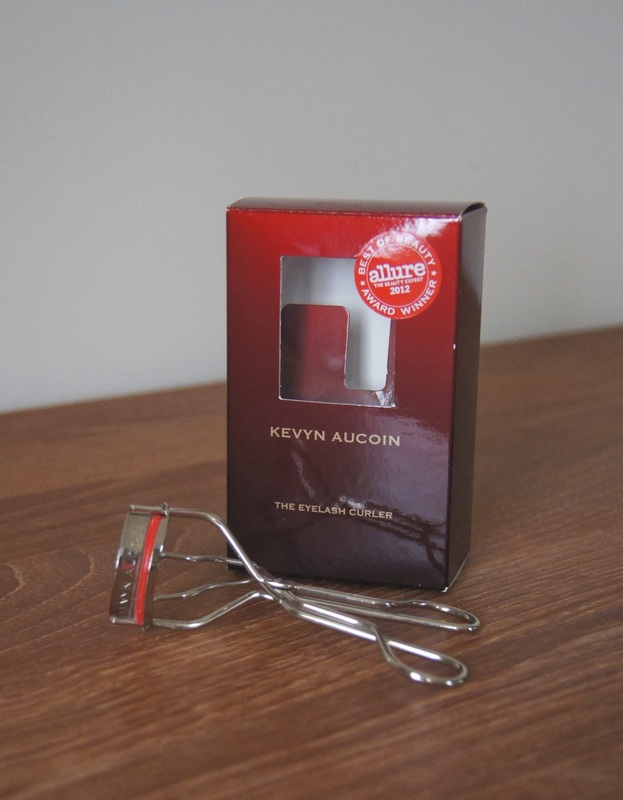 Kevyn Aucoin did actually play his own part in designing the famed, cult-favourite Shu Uemura curlers prior to bringing out his own collection, but he clearly kept the best design all for himself. Understandable, really. Perfectly curved, the curlers easily sit at my lash line and don't pinch the delicate skin or pull any of the precious hairs out, leaving them uneven and sparse. There's no watery eyes to ruin my makeup. Eyes are instantly left looking so much bigger and brighter, even without applying mascara. 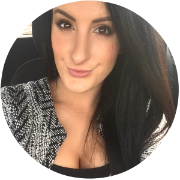 With a slick of mascara over the top, the results are even more amazing and surprisingly, an average formula can end up being impressive. My other half has been fooled into thinking I've been wearing falsies after using these curlers and he never pays attention to such a small detail as that! Honestly, they're insane. Call me crazy, but I do have a backup pair waiting in the wings, just in case I misplace or break my current curler. That would break my little heart - lame, I know! Like most people, as soon as the Real Techniques brushes launched, I was hooked. After accumulating practically the whole range, my makeup brush collection has been taken over by the Pixiwoo brand and for good reason. Inexpensive, without compromising on quality, the synthetic taclon, cruelty-free brushes are a total bargain, rivalling high-end brands that charge upwards of £30 for even an eyeshadow brush, simply because they can. Since I've had them, I genuinely don't think I've used another brand's brushes for my face makeup. Using the buffing or expert face brush for foundation, the blush brush for powder and bronzer, the duo fibre contour brush for powder blush and the stippling brush for cream products, I'm covered for all my complexion makeup eventualities. Whilst the eye brushes are also great, I do still favor my MAC 217s and 224s. Not only is the permanent range amazing, but so too are the limited edition follow-up collections, including the duo-fibre set and the more recent, retractable offerings. Making sure you maintain the brushes is always important, by cleaning them properly and carefully. 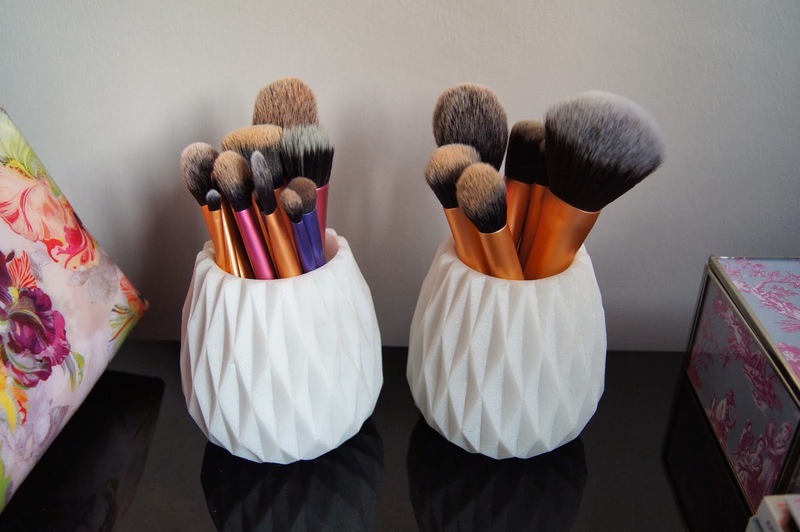 If looked after well, these tools stay soft even after washing multiple times, keep their shape and don't leave any stray hairs behind on your face as you apply your makeup. There's nothing negative to say about these brushes and if you'd like to read a more in-depth review, you can check out my Real Techniques Makeup Brushes Review. 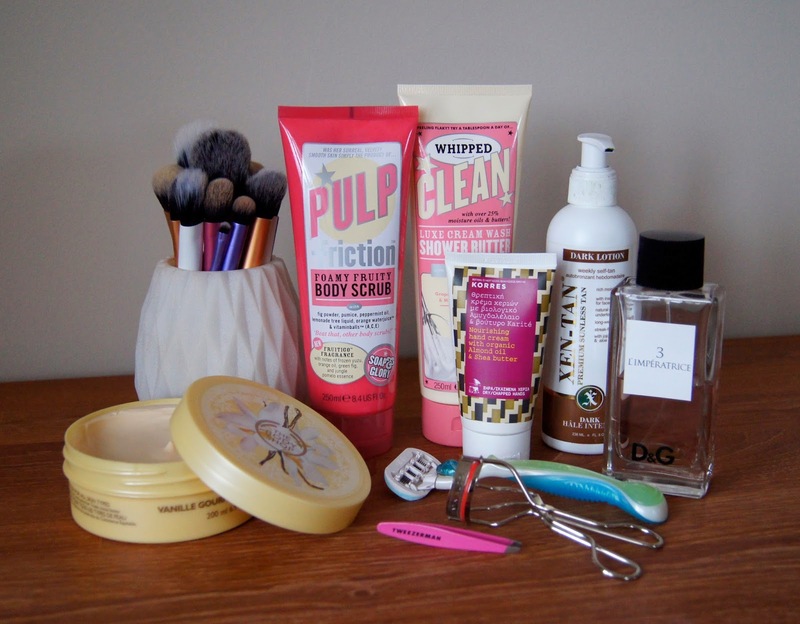 Which body products and beauty tools were you loving in 2013?